Our beautiful cat PiPi developed hepatic lipidosis [fatty liver] after a stressful move from Japan to the United States, just before her 4th birthday. After she had a feeding tube surgically inserted, she still had a long and bumpy road of home care ahead, which was a daily challenge, sometimes with very little hope.Dr. Roller’s care and advice got us through that dark time, and her keen attention to even the smallest details helped me understand the various signs of illness and healing in my cat, who made a full recovery and recently celebrated her 6th birthday! If not for Dr. Roller, PiPi wouldn’t be with us today, and our family is still a family thanks to her incredible dedication. Miss PiPi raises a paw to you, Dr. Roller!! 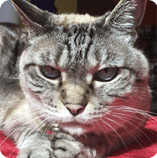 I can’t recommend the Boise Cat Clinic enough, as our cats are our family, and we want to give them the best care that they truly deserve, from devoted staff who love cats as much as we do. – Katie & Kazu M.